Right-wing news website The Federalist published on Thursday an exclusive transcript of Attorney General Jeff Sessions' speech to the Alliance Defending Freedom (ADF) — a conservative Christian law firm that was designated a "hate group" in 2016 by the Southern Poverty Law Center. The Justice Department confirmed in an email to NBC News that the transcript was legitimate. ADF did not respond to multiple requests for comment delivered on Wednesday and Thursday. In his off-camera, closed-door speech about religious freedom delivered Tuesday night, Sessions announced new federal guidance is on the way. "Since he was elected, President Trump has been an unwavering defender of religious liberty," Sessions stated. "The president has also directed me to issue guidance on how to apply federal religious liberty protections. The department is finalizing this guidance, and I will soon issue it." The Justice Department would not comment on the impending guidance. "The guidance will also help agencies follow the Religious Freedom Restoration Act," Sessions continued in his prepared remarks. "Congress enacted RFRA so that, if the federal government imposes a burden on somebody’s religious practice, it had better have a compelling reason." When the speech at Alliance Defending Freedom's Summit on Religious Liberty appeared on the Attorney General's public schedule, it was cause for concern among LGBTQ advocacy groups and Democrats — many of whom issued statements questioning why Sessions would speak to what some call an anti-LGBTQ hate group due to its history of litigating against LGBTQ rights. But after reading the transcript and learning of the Justice Department's plans to create a new federal policy on protecting religious liberties and doubling down on enforcing the Religious Freedom Restoration Act, advocates suggested Sessions was more interested in protecting the right to discriminate than the freedom of religion. "Here he goes again. It appears [what] the Attorney General is saying is that he will only enforce a 'civil rights' law that is meant as an excuse to discriminate; but he won’t enforce longstanding, real civil rights laws like Title IX, Title IX and Section 1557 of the Affordable Care Act," Mara Keisling, executive director of the National Center for Transgender Equality, said in an email sent to NBC News. 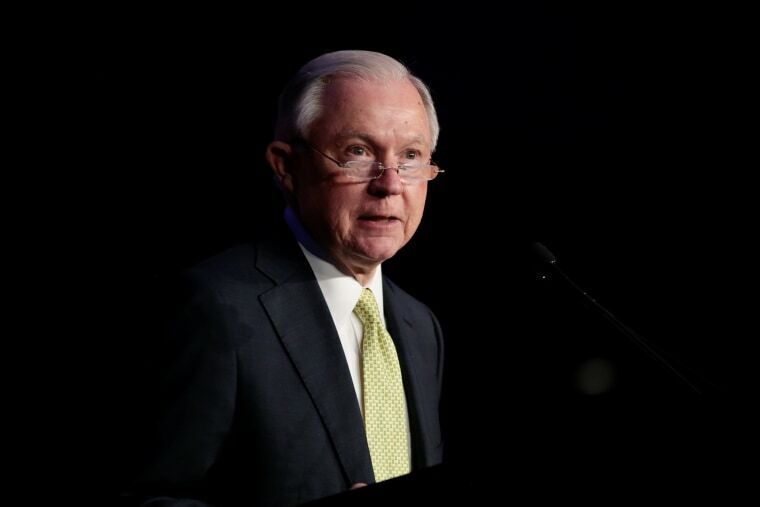 JoDee Winterhof, senior vice president for policy and political affairs at the Human Rights Campaign, also assailed Sessions' speech and his promise of federal guidance on religious liberty protections. "Sessions’ alarming comments proved what LGBTQ and civil rights leaders know to be true — that he cannot be trusted," Winterhof told NBC News via email. "A month ago, he vowed to protect transgender women from violent attacks and now we find him promoting license to discriminate laws. This is another predictable step for the anti-LGBTQ Trump-Pence Administration." The Trump administration has promised several times to enact some form of increased religious liberty protections. During the campaign, Trump said he would sign the First Amendment Defense Act, a bill that would allow businesses to turn away LGBTQ people as well as unmarried couples and single mothers. Before being confirmed as Attorney General, then-senator Sessions was a sponsor of the First Amendment Defense Act. In May, President Trump signed an executive order on religious liberty that allows companies to reject the Affordable Care Act's mandate on birth control coverage. Trump's administration has been criticized by LGBTQ advocates for a series of actions ranging from erasing LGBTQ content from federal websites one day after the inauguration to the Department of Education's revocation of an Obama-era policy that increased transgender students' rights. Sessions has also faced criticism from LGBTQ rights advocates. In a January interview, the mother of slain gay college student Matthew Shepard told NBC News that Sessions fought against the Matthew Shepard and James Byrd Hate Crimes Act when it was being debated in 2009. In a lengthy speech decrying the legislation designed to help victims, Sessions said that "gays and lesbians have not been denied access" to anything, and that hate crimes were "thought crimes."